Thu., Sept. 29, 2016, 6:29 p.m. The two candidates vying to replace Spokane County Commissioner Nancy McLaughlin squared off in a debate Thursday afternoon at the Spokane Club. Republican Josh Kerns touted a plan to attract jobs and Democrat Candace Mumm outlined solutions for a faltering criminal justice system – messages that propelled them both through the August primary, which left McLaughlin with no chance of retaining her seat. 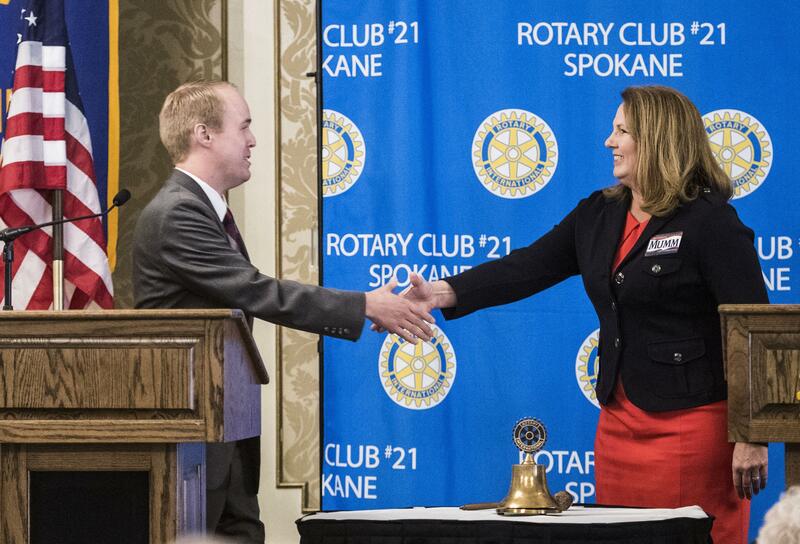 The 30-minute debate, hosted by the Spokane Rotary Club, also touched on some national headlines, including Republican presidential nominee Donald Trump and an armed standoff earlier this year at a wildlife refuge in Eastern Oregon. Mumm, a Spokane city councilwoman, said she hopes to improve the criminal justice system, which accounts for about three-quarters of the county budget. Some solutions are already being developed, but more must be done to reduce violent crime and property crime, she said. Kerns, a legislative aide to state Rep. Jeff Holy, didn’t propose any direct changes to the court system. He said the focus should be on the local economy, particularly jobs. “When someone is gainfully employed in this community, they are statistically less likely to be committing crimes,” he said. Kerns also repeated his plan to ease zoning and permitting rules on the West Plains. The candidates had prepared for most of the moderator’s questions, but each candidate was allowed to write one “surprise” question for the other. Kerns asked Mumm why she supported a City Council ordinance requiring businesses to pay employees for up to five sick days each year. Kerns claimed the ordinance, enacted in January, will cost businesses $24 million annually, citing figures from the Washington Policy Center, a conservative think tank. Mumm defended the policy as a way to protect workers, saying she had heard “horrible” stories of abuse by local employers, which she declined to name. She noted that she supported a one-year exemption from the ordinance for new businesses. Mumm asked Kerns about his political ties to controversial state Rep. Matt Shea, who visited Oregon’s Malheur National Wildlife Refuge in January, when it was occupied by armed protesters. Shea, along with legislators from Washington and Idaho, made the trip even though local law enforcement and FBI officials had urged them not to. Mumm said she’s heard from Spokane County sheriff’s deputies who are concerned about Shea’s actions. She asked: What if a similar standoff were to happen on the Turnbull National Wildlife Refuge near Cheney? Would Kerns still support Shea? After the debate, Kerns also weighed in on the long-running public feud between Shea and Sheriff Ozzie Knezovich. In recent weeks, local elected Republicans have been unwilling to reprimand Shea for implying that a deputy was involved in a triple homicide north of Spokane. Kerns said the party’s only job is to get Republicans elected. “I don’t want to get in the middle of those two guys,” he said. Published: Sept. 29, 2016, 6:29 p.m.